Pioneers in the industry, we offer vortex orifice reynolds fluid mechanics, fluid mechanics bernoulli metacentric notches pitot tube and fluid flow and losses measurement from India. Plumbing is of FINOLEX make. All Machining parts Crome Coated. 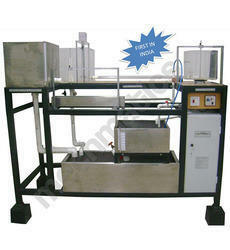 Free Forced VortexThis equipment is designed to produce and measure the characteristics of free and forced vortices. The apparatus comprises a clear acrylic cylinder on a plinth designed to produce and measure free and forced vortices. The free vortex is generated by water discharging through an interchangeable orifice in the base of the cylinder and the resulting profile is measured using a combined X-Y scale. The forced vortex is induced by a paddle in the base of the cylinder. The profile of the forced vortex is determined using a series of X-Y Probe. Orifice and MouthpieceThis equipment permits calibration of orifices of differing diameters. In the orifice and free jet flow accessory a constant head tank will be fed with water from the common Sump. The orifice is installed at the base of the tank. The head will be maintained at constant value by an adjustable overflow pipe and will be indicated by a level scale. A jet trajectory tracing device allows the path followed by the jet to be ascertained. This accessory should be intended to reproduce the classic experiments conducted by Professor Osborne Reynolds concerning the nature of laminar and turbulent flow. The equipment operates in a vertical (or Horizontal) mode. A header tank containing stilling media provides a constant head of water through a bell mouth entry to the flow visualization pipe. Flow through this pipe is be regulated using a control valve provided at the discharge end. The flow rate of water through the pipe should be measured using the measuring cylinder. Velocity of the water can therefore be determined to allow calculation of Reynolds’ number. Pumps with on-site service Warranty. The test section consists of a Venturi type section machined in clear acrylic. A series of wall tappings allow measurement of the static pressure distribution along the diverging-converging duct. The test section is arranged so that the characteristics of flow through both a converging and diverging section can be studied. Water is fed through a hose connector and should be controlled by a flow regulator valve at the outlet of the test section. This equipment allows a thorough understanding of the factors affecting the stability of a floating body. The equipment consists of an floating pontoon, the centre of gravity of which should be varied by an adjustable weight which slides and should be clamped in any position on a vertical mast. A single plumb-bob should be suspended from the mast which indicates the angle of heel on a calibrated scale. A weight with lateral adjustment allows the degree of heel to be varied and hence the stability of the pontoon determined. The flow over weirs and notches should consists of three different types of weirs and notches such as 60 angle, 90 angle and a rectangular notch. The carrier may be moved along the channels to the required measurement position. A stilling baffle located into the slots in the walls of the channel promotes smooth flow conditions in the channel. The rectangular notch or V weir to be tested should be clamped to the weir carrier in the channel by thumb nuts. Friction Losses in Pipes This equipment allows the pressure drop of water passing through a hydraulically smooth circular pipe to be measured in detail and the pipe friction equation should be to be verified. The energy losses in pipes accessory consists of a test pipe, on the side of the equipment, which may be fed directly from the common supply tank. 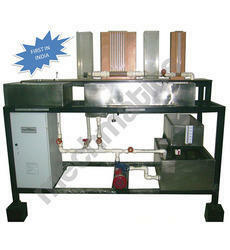 These sources provide high or low flow rates which may be controlled by a valve at the discharge end of the test pipe. Head lost between two tapping points in the test pipe is measured using manometer. Energy Losses in Pipe Fittings This accessory permits measurement of losses in different pipe fittings. The equipment is mounted on a free standing framework which supports the test pipe work and instrumentation. The following typical pipe fittings are incorporated for study: miter bend, 90 elbow, sudden contraction and enlargement and Gate valve. All are instrumented with upstream and downstream pressure tappings. These tappings are connected to manometer tubes using removable PU pipes, mounted on the framework. A gate valve is used to control the flow rate. Fittings : Bend, elbow, Valve, long bend, Enlargement & Contraction. A flow control valve permits variation of flow rate through the circuit. Pressure tapings are incorporated so that the head loss characteristics of each flow meter may be measured. These tapings are connected to manometer with air bleed valve. The circuit and manometer are attached to a support framework which stands on the working top of the setup. 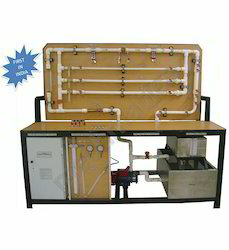 The bench is used as the source of water supply and for calibrating volumetrically each flow rate. Aim is to measure the Discharge coefficient of each of the flowmeters. Study of Pressure Measuring DevicesThe Set – Up Consist Of Different Pressure Measurement Device Fitted on a board. The Students Can Have Good Insight Of The Devices. It can be used to Demonstrate The Working Of Different Pressure Measuring Devices and to Measure The Pressure Practically By Different Pressure Measuring Devices. A hand held syringe is provided to generate Vacuum and create pressure for Sensitive manometer.